← Ramona L. Frischman, Ed.D. 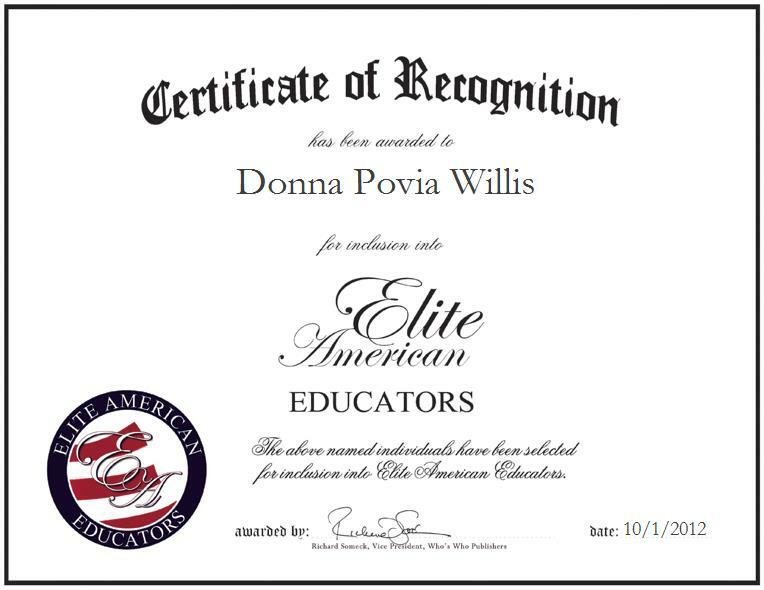 Donna Povia Willis is a teacher at Pedro Menendez High School, a subsidiary of the St. Johns County School District. With a strong background in the field of education, Mrs. Willis shines as a luminary in the arena, and she feels that the most gratifying aspect of her career is watching struggling children become successful. With nearly four decades of professional experience, Mrs. Willis currently conducts freshman seminars on physical and laboratory science. She holds a Bachelor of Arts in Education from Flagler College and a Master of Education from Troy University. She also earned a Certification in Physical Education, a Certification in Elementary Education, and a Certification in General Science. Mrs. Willis’ school district is ranked number one in the state of Florida. She also does public speaking at the local teachers association.